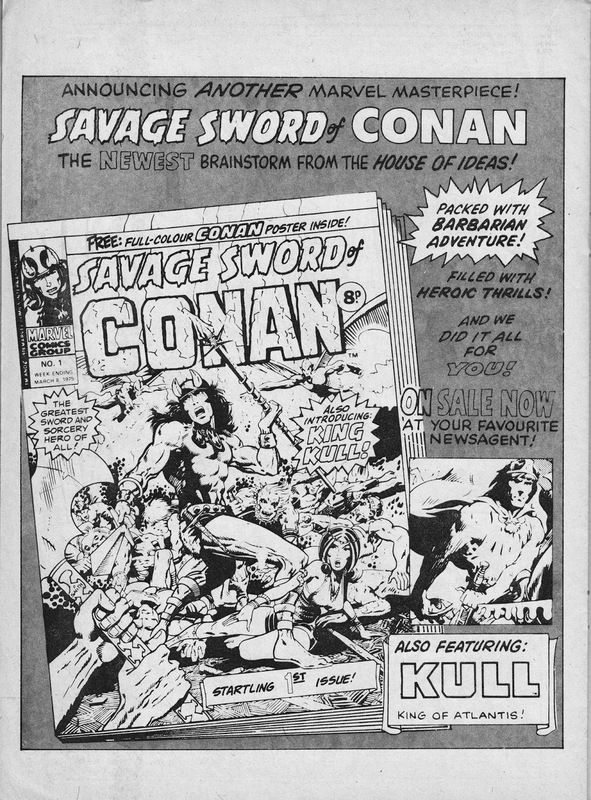 This is the March 1975 Launch Ad for MARVEL UK's SAVAGE SWORD OF CONAN. This turned-out to be the first duffer from the Annex of Ideas: the ill-fated weekly closed after only eighteen issues… although the strip went on to have a healthy run as the regular back-yup strip in THE AVENGERS and then transferred into THE MIGHTY WORLD OF MARVEL. The British Bullpen recycled the title (purloined from the US magazine… which supplied the bulk of the material) for a monthly incarnation a few years later. This proved a much more successful endeavour, clocking-up a commendable 93 issues. The material here, which came from the earliest issues of the US colour comic (the b&w printing was a great showcase for Barry Windsor-Smith's stunning art), appeared again in the 1980-81 CONAN THE BARBARIAN POCKET BOOK.